I'd been away from Cloud Party for a while, but a conversation during yesterday's VWER meeting spurred me to log in during the meeting. I'd heard of but not tried the virtual world's new customization features. At login, I found myself in a welcome area, and wearing a new basic avatar greatly improved from the one I'd driven before. Cloud Party's little smart-phone icon was drop-dead easy to recall after time away, unlike many aspects of Second Life's bloated interface. I did not recall how to get home, but a navigation app on the phone, much like a maps tool for a physical phone, got me to Shiny Canyon in one smooth teleport. Back in my stylin' pad there, I decided to try the customization features now in CP. 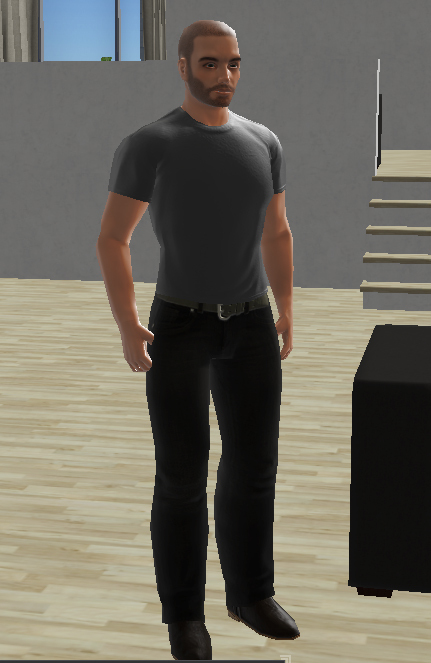 First, I found it hilarious that unlike SL, where most male avatars are hulking body builders, my CP avatar was a skinny white guy. I'm no Hercules in real life, but farm work has made me rather burly and skinnier in the middle. So I buffed CP Joe Essid out to match the actual one. The process greatly resembled SL's customization features, one aspect of SL that I found students mastered quickly. One can also save outfits and looks, as in SL. The lag was negligible as I did all this from within Firefox. Soon areas of outfit creation will merit a spin. I do not know what "movement" does, for instance. 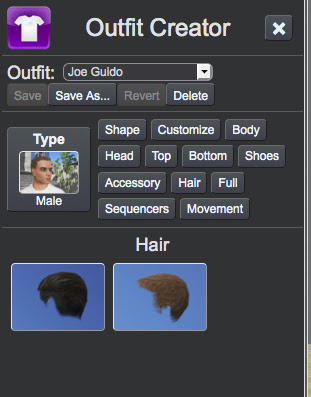 In the hair settings, I rather enjoyed the "stubble" feature for the beard. With hair removed, the avatar got the same swarthy look as this blogger. Enter, Guido... rather like me but younger. There is no geezer-slider in CP's custom features. At the VWER meeting, educators were too quick to dismiss Cloud Party for its name and lack of community. I'm not so sure. Despite a name I don't like all that much, anything that runs this well in a browser merits a close look. And without Facebook logins as mandatory (I still use mine) and a working virtual currency plus marketplace, this world deserves more press from educators. I'll have to have a try with the in-world building tools, rumored to be difficult. I'll also have to see if the ability to connect islands to make contiguous regions exists, also as rumored. Shiny Canyon will never be the same. The Phone Book's Here! The Phone Book's Here!